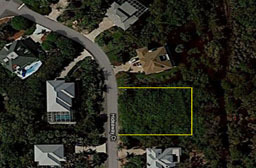 Terrific Near Beach lot overlooking conservation land in desirable Sea Oats Subdivision. Watch the sunrise from your lanai and listen to the birds singing. Stroll to Beach Access #1 on West Gulf Drive and watch the sunset. This private lot allows 2700 sq. ft of developed area with 2025 sq. ft. of impervious coverage. Lot will be cleared of exotics summer 2011. Plans available for a 2400 sq. ft. Old Florida Style home designed for this lot.